There was a recent request on LMA Connect, the legal marketing association's discussion forum, for benchmarking data for paralegal and legal secretary staff to lawyer ratios. There are a number of good sources for this sort of thing, which savvy readers submitted. However, I was compelled to provide a contrarian response. I question the validity of benchmarking data like this, particularly in today's economy. Human nature generally nudges us toward safe choices as defined by how many others have made similar choices. In many law firms, precedence is the dominant method of decision making mostly because it's the method learned by lawyers in the practice of law. But those of us tasked with bringing sound business practices into today's law firms have an opportunity to introduce more rigor into the discussion. This applies to many areas of practice management, but in light of the recent law firm layoffs and downsizings, it seems even more poignant when applied to law firm staffing. A benchmark for paralegal/secretary to lawyer ratio is undoubtedly of keen interest to law firm leaders entertaining the question, "Which staff positions can we eliminate to reduce our cost base?" The problem is, the ratio is a function of the nature of the practices, the current workload, the culture and productivity levels. Practices that rely heavily on paraprofessionals, e.g., real estate, litigation, will carry different ratios than other practices. Some practices are busier than others, for example those addressing counter-cyclical client work. Those that aren't busy tend not to delegate work downward, so partners are doing work today that a year ago a mid-level associate might handle. And some cultures better exploit technology and knowledge bases to improve productivity levels, so their ratios will differ from competitors in the exact same practices. In this light, it seems a trifle presumptious to believe that much value can be derived by examining staffing ratios compiled by surveying dissimilar firms in dissimilar markets comprised of dissimilar practices and targeting dissimilar clients. Unfortunately, it's hard work for leaders to examine the organization's business processes and culture to determine the appropriate staffing ratios for their firm. But if the objective is to recalibrate capacity so it's aligned with current demand levels, with enough flexibility to adapt as demand returns, then it's sensible to roll up the sleeves. Too often, however, the objective appears to be to find a quick and easy rationale to lower costs by "bringing our staffing ratios in line with industry standards." Cost cutting in an enterprise impacted by a recession is by definition necessary. Tough decisions have to be made. 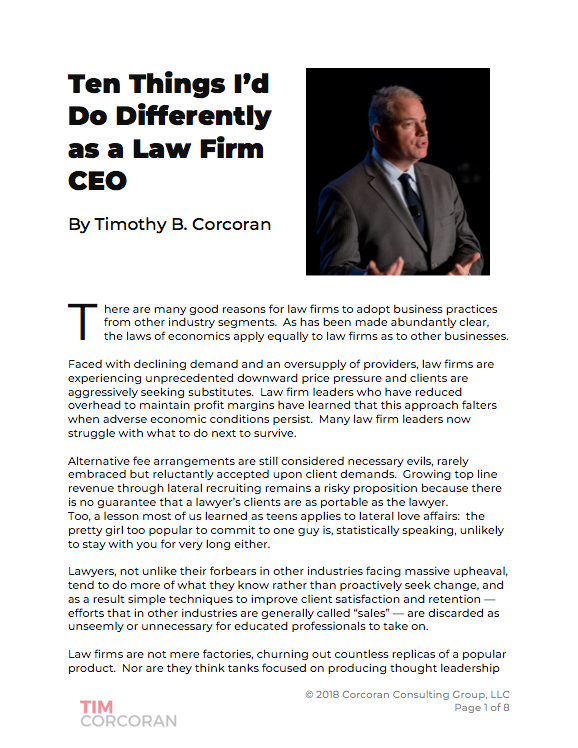 The law firm leaders who assess their enterprise in light of its long term outlook and make specific adjustments based on sound business rationale will have an easier time ramping up when demand increases than those firms using imprecise benchmarks to simply lower costs today without regard for tomorrow. Business process re-engineering and improvement programs are more effective in the long run for aligning staff to workloads. These processes generally result in cost savings and are, therefore, often self-funding exercises. And we shouldn't have to repeat the growing theme (but we will) that law firms that find more efficient ways to deliver legal services are better positioned to implement alternative fee arrangements, which in turn lead to increased client retention. These are not just good ideas for today's law firm leaders. They are essential.